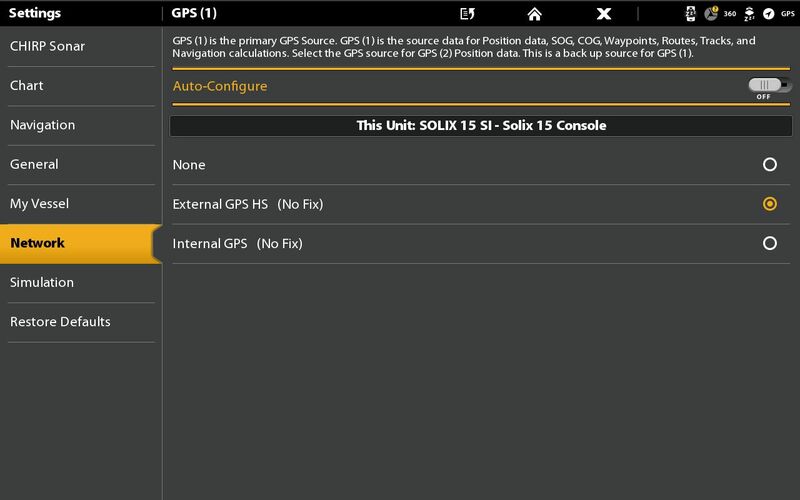 Can an external gps puck antenna be added to Solix? Does the separate receiver/antenna improve the accuracy or just relocate the point on your boat that is marked. I wouldn't think there would be any more accuracy than the internal GPS You might do a Google search on high definition GPS and see what is said. 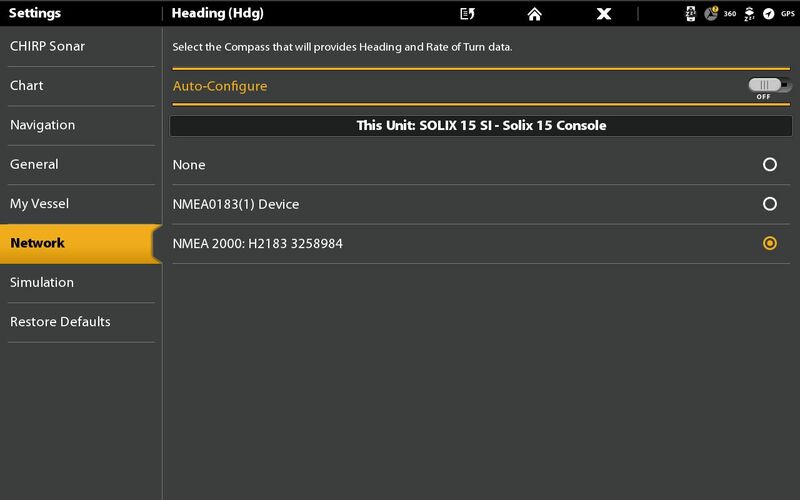 You can also use a NMEA GPS with the Solix. What I’m most interested in is the accuracy of the boats heading. It’s actual location on the water is already very accurate but when you slow down or stop then the direction your boat is pointing in relation to what shows on the screen lags behind. At least that was the problem with the Lowrance HDS units I had previously. Adding the external puck increased the refresh rate and kept screen position in line with actual boat position. I can't say that I have had that problem. There might be someone on the sight that can answer the refresh rates between the internal GPS and external heading GPS. If no one here can answer that question you might contact Humminbird thru E-Mail. I am pretty sure that the heading sensor in the humminbird external GPS/HS puck is not created by the GPS function. It is created by some form of an "electronic compass" . I have never seen any data on the repeat-ability of the compass. The puck has an arrow on it the must be pointed toward the front of the boat when it is installed. Yes, exactly, that give more stability for position ,better that the rate of refresh! I'm in the middle of the same debate. To me the offset of the GPS sensor to the transducer would be additive to the std GPS error/accuracy factor. I am not sure what you are debating here. Hummingbird GPS Accuracy is about 2.5 meters, whether it is from the head unit or an external GPS puck. So when you mark a Waypoint it can save a location that can be up to 2.5 meters off from the true physical location. Then when you return to that Waypoint you can arrive "at that location" within 2.5 meters of the saved location based on the GPS antenna. So the now your antenna could be as much as 5 meters off from the true physical location. Now based on the direction of arrival, the location of the antenna, and the location of the transducer you might easily be 25 ft off from the true physical location you originally saw on the 2 D image on your Solex. If you use an external GPS puck and locate it as close to the transducer as possible you can reduce some of that error but not all. If you use a HB 360 and an external transducer you can get pretty close to finding the item's true physical location on your return. Highly accurate GPS locating requires 3 antennas to triangulate the signals. The newest Minn Kota GPS controlled spot lock accuracy is about 1.5 meters with two antennas. DP Low and High are subjective measures. Accuracy and Repeat-ability are objective measure that can be quantified by hard physical numbers. HB is making and selling consumer quality equipment, not high end GPS base surveying equipment. As a fishing consumer, I am happy with the ability to mark a way-point and get myself back to within 25 ft of where I was when I marked it. My HB 360 imaging can then display the lake bottom and I can locate the brush pile, big rock, weed edge, weed hole or other bottom structure where fish MAYBE hiding. If you want something better than that, then you need to open your wallet and let out something closer to $4000 for a GPS only to get a surveyor quality GPS unit. HB units be they Solix or Helix are more than GPS unit. They are Sonar, GPS, Imaging Systems with memory, computer operating systems, networking and mass storage interfaces. I maybe old and dusty, but I remember when a fish finders had spinning wheels and flashing lights and sold for the equivalent of what a Solix sell for today. spent 50 years implementing that technology in manufacturing environments. The one thing that will never change is that you get what you pay for. If a large share of the market demands more accuracy and the government will allow more accuracy. But that is not the direction I think HB and others are going. Quality imaging appears to be the thought for the day.